Craft Editions visited The London Design Fair at The Old Truman Brewery on the 22nd and 24th Sept 2016. It was a vast collection of international designers, brands and makers and due to the sheer size of the event we decided to spend 2 days meeting and talking to makers. Here are 5 that stood out to us for their craftsmanship and design. 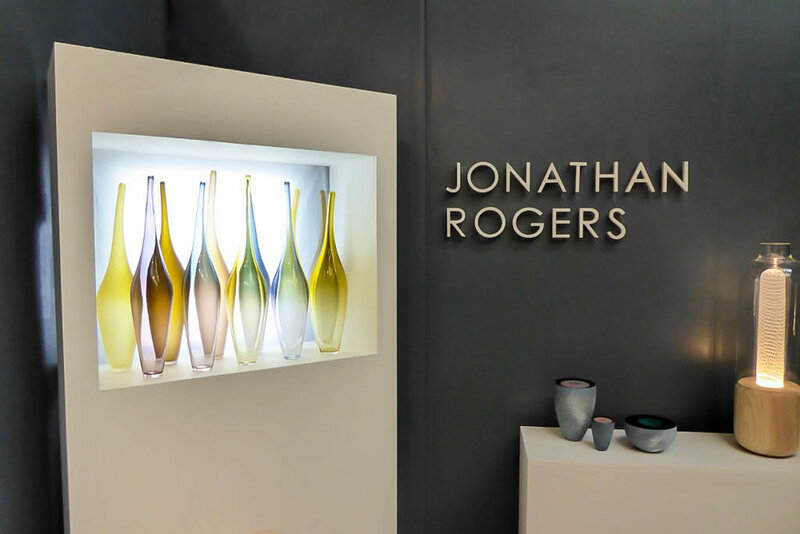 Jonathan Rogers – Jonathan started blowing glass at 16 and launched his own studio in Clavering, Essex in 2013. He uses traditional blowing and finishing techniques and his work features multiple overlays of colour and clear glass, which are revealed through the cold-working process. Jonathan’s work is visually striking and he describes his forms as “modern, understated, fluid and elegant”. Find out more about Jonathan Rogers here. Mourne Textiles - At the London Design Fair we spoke to Mario Sierra, one of the owners of Mourne Textiles. Mourne Textiles is a family business based in Killowen, on the side of the Mourne Mountains, Northern Ireland. It has a wonderful history dating back to the 1940’s when it was started by Mario’s grandmother, Norwegian design pioneer, Gerd Hay-Edie. The workshop hand-weaves on 8 traditional wooden looms and produces a range of beautiful items including blankets, cushions, rugs and a range of clothing. Many of the designs are based on work from the original handbooks by Gerd Hay-Edie. Find out more about Mourne Textiles here. Harry Owen – Harry handcrafts his beautiful leather goods using traditional tools and techniques. His bespoke range of bags, small goods and belts combines his obvious craftsmanship with the natural beauty of the leather he uses. Harry has an obsession with leather objects, which he says comes from “the seductive quality of the material and a fascination with objects we carry with us". Find out more about Owen Leather here. Paul Wearing - Paul studied ceramics in Cardiff where he has lived and worked ever since. He says that "textures that manifest naturally on surfaces within diverse urban and rural landscapes” are key to his work and he expresses his relationship to these through the glazed surface on his sculptural vessels. Paul uses two techniques to form his work, press-moulding for the base and coiling to develop the shape. Surfaces are built up and transformed through the application of multiple layers of slip and glazes. The final dramatic effect is produced in the kiln. Find out more about Paul Wearing here. I Liang Liu – I Liang is originally from Taiwan and studied both Ceramic Design at Central St Martin's, and Ceramics and Glass at the Royal College of Art. He talked to me about the strong influence of his homeland and its culture on his work. I Liang is interested in the relationship between the product and its user and he produces a range of ceramic tableware that is both functional as well as beautiful in its form and colour. Find out more about I Liang Liu here. At The London Design Fair a number of brands and makers previously featured on Craft Editions were also present; including Arran Street East. Find out more about the London Design Fair here.